When you really get into sewing, you start to see fabric everywhere. Seriously. Everywhere. I don’t get rid of clothes anymore if the fabric is sew-worthy, as evidenced by my upcycle/recycle/refashion posts! But now I can’t even go through the grocery store without eyeing the tiny section of kitchen towels that are in the baking aisle. And Target? FUHGHETTABOUDIT. Towels, kitchen towels, napkins, shower curtains, sheets, placemats, table runners…. there is fabric everywhere, and lots of super cute prints, too! Guess how this tutorial came about? Yep. Walking by the kitchen linen aisle and spotted this GORGEOUS placemat. I mean seriously, it is so beautiful and has such great texture. I ended up buying two – one in this coral color and another in a lovely mustard for a later project! So anyway, this placemat happens to be lined (bonus!) which made my mind start shouting ideas at me in a tourette-like fashion: BAG! Pillow. Coasters. CLUTCH! Ah, yes, I think a clutch is perfect. I wanted to make a very stiff, structured clutch – not the floppy kind (I feel like stuff would fall out of a floppy clutch, but you can skip this step if you want a floppy one for yourself), so in lieu of interfacing I used stiffened felt. WHAT, you say? Stiffened felt. I love this stuff and I use it all the time! The placemat is 14×19 and a sheet of the stiffened felt is 12×18 so it fits perfectly inside. You can get it at your local craft store, or by all means, use some interfacing that is stiff if you want more structure to your clutch. Push it all the way in, there will be a little room on all sides. ..and sew that baby back up! Be sure to go back and forth a few times at the top and bottom to seal off the thread. You won’t sew through the felt since it is shorter than the placemat. Now isn’t that lovely? Hold up the placemat and shake it around a bit so the felt makes it back to the center. Next you’re going to fold your very stiff placemat into a clutch. Get ready, you’ll need some muscle. I put pins to mark my place and went back to the sewing machine. Using a straight stitch, I started at the pin and went straight down to the bottom. Since the placemat is lined and you have the felt in there, your machine and needle will basically tell you where to sew and give you your seam allowance – it’s about 1/4 -1/2 inch. Be sure to go back and forth a few times at the top and bottom again, to secure your thread. This fabric hides your thread & seam so nicely! Now go sew up the other side, too..
..and check your work out — you now have a lovely pocket! Next step: use your muscles to fold that top down. Press it really well, it’s going to want to pop back up on you. I set my laptop on mine for a while just to tell it who is boss. This is where the velcro comes in. AGAIN – I want to reiterate that sew-on velcro is much preferred over the sticky-back velcro I am using here. Trust me. I went through 2 needles! Pick your spot where you want the velcro placed and pin it in place. I joined the velcro once pinned and folded the top of my clutch over to get my spot for the second piece on the main body of the clutch like this..
… and then secured the second piece of velcro. Break out your needle and thread and sew those puppies on! Be sure to go through the placemat and the felt or interfacing if you used it — you’ll want it to be secure and not to pull away from the structure of the clutch. I used a contrasting thread, I thought it would be cute! Since I used the sticky-back velcro, I had to use all my power to push the needle through. But the end result was worth the sore thumb muscles! Once you’ve sewn both pieces of velcro on..
Isn’t she pretty? Dramatic, but still so very classy! This entry was posted in DIY Love, Everything, Fabric Love, Gift Ideas, Handmade Love, Sewing, Tutorials and tagged assistant, bag, beginner, beginning, birthday, boss, christmas, clutch, DIY, easy, friend, gift, girl, idea, mat, mom, mothersday, place, placemat, present, purse, secretary, sew, sewing, sister, stickelberry, target, tutorial, velcro, woman on July 1, 2015 by Danielle Stickel. May is almost upon us which means that it is just about time to remind the Moms of the world just how special and amazing they are. I didn’t get it before, not really, but now that I am a Mom, I have the inside scoop. Being a Mom isn’t always easy — it is often hard, stressful, exhausting… but it can also be so amazing, joyful and full of SO MUCH love (it can’t be quantified!). Our Moms deserve props! So now is your chance to tell the Moms in your life that they ROCK, and to thank them for putting up with loving you and taking such great care of you. I hand picked a few items from Zazzle to share — some nice things I like and thought other Moms might too. 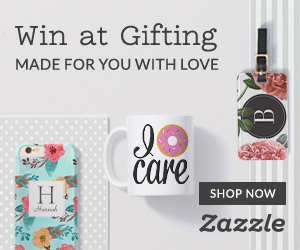 A few of them have a little Stickelberry touch to them, but do check out the enormous selection of amazing gifts on Zazzle’s website — and take advantage of the Mother’s Day sale! Now through MAY 4th – get 50% off Express Shipping by using code ZEXPRESS4HER at checkout!! I love these mirror compacts! They are so cute — they come in a few different shapes, a bazillion different designs and colors, and if you want you can customize them with a monogram like I did. They are the perfect size for a purse or small clutch! It has the up close and personal mirror on the bottom, too…perfect for obsessing over stray eyebrow hairs. You can find my designs here or browse through the entire collection available here. Another one of my favorites, these cute paper journals are great for Moms who take notes, jot down ideas, doodle (my favorite pastime), and make lists! I love this design (not mine!) and hope my Mother-in-law likes it too (she’s totally reading this right now). Small enough to fit in your purse, and super cute. Here it is next to the compact mirror to give you an idea of the size. I love that most of them are customizable, so you can put in whatever words you want! You can find this design here, or browse the entire collection here. And now, hands down one of my favorite gifts (drumroll, please): The GINORMOUS, personalized box of chocolates. No no no no… that picture doesn’t do it justice (but aren’t those kids cute?! You can put your own on it, obviously, but I like those little fellas right there ;)). Let’s try this one — check out the SIZE.. Seriously. That’s NOT a mini coffee mug – that’s like my everyday jumbo mug. The box itself is gorgeous, totally a keepsake item! ..and did I mention it’s full of CHOCOLATE!? Beautiful chocolate no less, and you can get all one type, a giant bar, or a mix like I did here. You can find this design (Stickelberry!) here, or browse through the entire collection here. So… you have all these gifts, and you need something special to put them in, right? Mom deserves a better container than a paper gift bag. How about something cute, sweet, meaningful and REUSABLE? Enter the Mom tote. It’s perfect for everyday use, for anything she can think of.. groceries, books, toting stuff to and from your house, you name it. They are very affordable and they have a natural element that makes them so lovely, too. Does the design look familiar? 😉 It can be rolled or folded up into a tiny little square for easy, compact storage. Moms love that. You can find this design here, or browse through the entire collection here, and you may even want to try MAKING YOUR OWN with pictures of family! So there you have it! My favorite picks from Zazzle for Mother’s Day. Do go and check out what they have to offer if you haven’t already. I also HIGHLY recommend signing up for the free trial of Zazzle Black, which gives you free shipping for 30 days, and then a nominal fee of $9.95 annually. This more than pays for itself if you order from them often (I’m guilty)! Hope you Moms out there have a wonderful Mother’s Day! 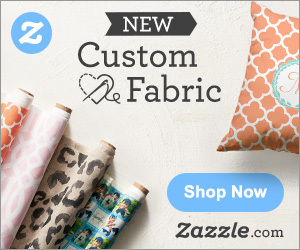 *I am a Zazzle affiliate, which means I will make a teeny tiny amount of commission from any products purchased through my links. I wouldn’t share them with you if I didn’t love them!!! This entry was posted in Design Love, Everything, Gift Ideas, Just for Fun, Mamahood and tagged bag, birthday, box, car seat, chocolates, christmas, compact, compacts, custom, day, design, for, gift, gifts, grandma, granny, green, grocery, idea, ideas, may, mirror, mirrors, mom, mother, mothers, mothersday, nana, notes, personalized, photo, photos, pocket, present, presents, purse, reusable, sale, shop, shopping, stickelberry, tote, zazzle on April 27, 2015 by Danielle Stickel. Print on heavy paper – cardstock works great! Need other ideas for Mom? Check out these items in my Zazzle store! This entry was posted in Craft & Decor Love, Design Love, DIY Love, Everything, Gift Ideas, Paper Love, Printables, Stickelberry Design and tagged birthday, black, card, christmas, day, DIY, free, gift, heart, hearts, http://stickelberry.com/?p=885, mom, mother, mothers, mothersday, present, printable, red, stickelberry, tag on September 8, 2014 by Danielle Stickel.